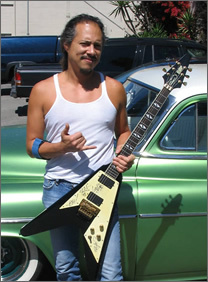 A ten year old guitar played by Metallica lead guitarist Kirk Hammett is on sale online for $35,000.Â Hammett used the ESP Flying V guitar live on stage prior to August 1998. Seller Neals Vintage Guitars is offering up the instrument on eBay.com for the fixed price. A statement from the seller reveals, “Kirk played this guitar in concert quite a bit! Just after that, he gave me a backstage pass for a show at Irvine Meadows in Orange County, California on the Load tour, I went backstage and had everyone in Metallica sign the guitar, I also had them sign the Load CD. I then had the pickguard sprayed with a clear coat to protect the signatures. “Then, in 2007, I was lucky enough to go the studio where Metallica was recording their most recent album, Death Magnetic.